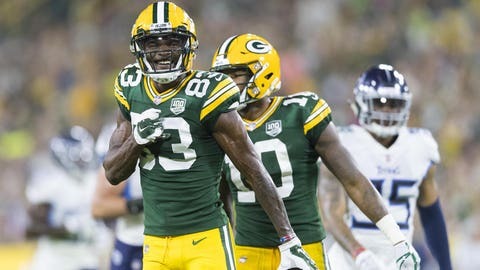 Marquez Valdes-Scantling had the best game out of the three rookie receivers on the Green Bay Packers, catching five passes for 101 yards. GREEN BAY, Wis. — The three rookie receivers of the Green Bay Packers had a mixed debut. 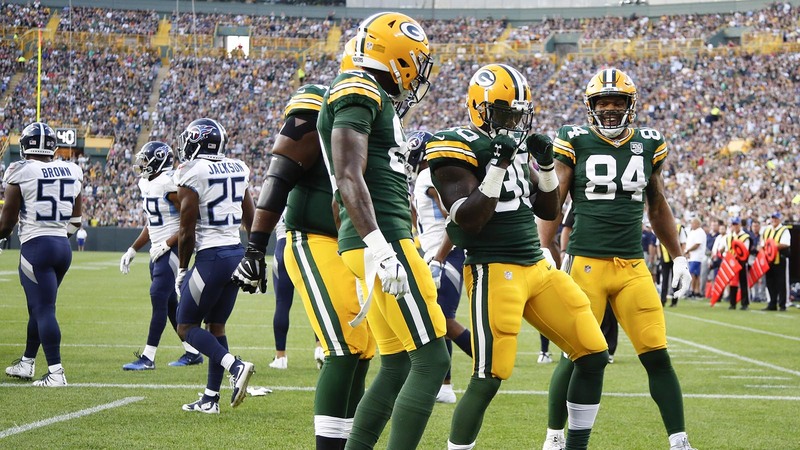 J’Mon Moore, Marquez Valdes-Scantling and Equanimeous St. Brown had their moments, but also showed room for improvement in the Green Bay Packers’ 31-17 victory over the Tennessee Titans on Thursday night. Valdes-Scantling, a fifth-round pick from South Florida, had the best game of the three, catching five passes for 101 yards, including a 15-yard touchdown from No. 4 quarterback Tim Boyle. Brown, a sixth-round pick from Notre Dame, had four catches for 61 yards, including a slick 28-yard catch-and-run to help set up Valdes-Scantling’s touchdown. “I thought they did a really good job getting off the line of scrimmage,” coach Mike McCarthy said Friday. He isn’t a rookie. He’s in his fourth training camp after two years on the Cincinnati Bengals‘ practice squad and after spending time on the Packers’ practice squad at the end of last season. But while the 26-year-old Kumerow came from Division III Wisconsin-Whitewater, he’s had the advantage of NFL camp experience and has avoided the inconsistency the three rookie draft picks have exhibited. After that practice, Rodgers, who ran the scout-team offense because he wasn’t going to play against the Titans, listed players who were doing things the right way, but left the three rookie receivers off that list. Valdes-Scantling had a leaping 51-yard catch on a deep pass by DeShone Kizer in the third quarter. He also made a nice in-the-air adjustment to pull down Boyle’s pass on the touchdown, which gave the Packers a 24-10 lead with under four minutes left. Moore’s biggest disappointment came in the second half, on a deep ball from Boyle on third-and-8 from the Green Bay 35-yard line. While Moore did a terrific job of getting open on the go-route, he dropped the ball at the Titans 29-yard line. Had he caught it, it likely would have been a 65-yard touchdown.